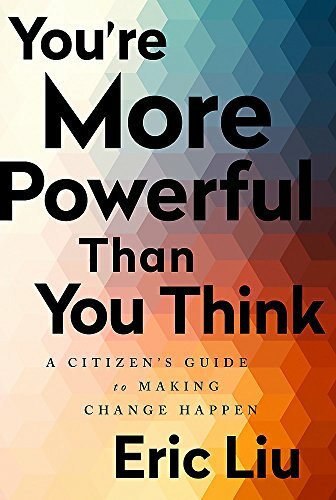 Near the beginning of You Are More Powerful Than You Think, Eric Liu uses the board game Monopoly as a metaphor. When one person has all the money and property and everyone else has nothing, he wins. But does he really? The game might be over, but the winner has no ability to buy anything with his money. He cannot sell any of his properties or even rent them out. Society has collapsed with his monopoly. That’s the inequality path. With this as the basis, Liu posits hope. Reading it, you would think the USA is a cauldron of activism. All over the country, people are innovatively challenging the Swamp. He breaks out their tactics into easy-to-digest, universal bullet points that anyone can employ to boost a cause or prevent a disaster. With all this action, there is plenty of inspiration and optimism. Liu says true alienation is deadly silent and sullen, and we aren’t there. He has been at this a long time, through his Citizen University. The book comes out of a TED Talk he gave. The upcoming era of post-truth, total corporate control, abandoning the environment, regulation and any sort of safety net should not end in total collapse, but rather bring forth a new generation of tacticians, strategists and protesters to keep the game from suddenly ending. That makes YAMPTYT a very uplifting book, and Liu packs wit with examples. My favorite is about Mauricio Lim Miller, who quit his government job dealing with aid for single mothers, to create an organization that actually helps them. His Family Independence Initiative puts them together so they can network, share stories, problems, innovations and solutions. They help each other, keep each other going, and the stats say they are less in debt and more successful because of it. They need less subsidies, start more businesses and buy more homes than those on the state welfare system he ran – and left. It is spreading to cities across the country. Liu’s basic message is – it’s all how you look at it. Like judo, you can take the enemy’s own strength and use it against him. You can reframe the story, use his own tactics - but better, and network your way to a broader base. Because power concentrates and ultimately isolates itself. Possibly the main point is that power is not a zero sum game. Anyone can create power, and it is done all the time. Just posturing as being powerful exudes power. Momentum, movements and investigative reports create power. Yet people beat themselves into believing otherwise. According to a Stanford study, the more participants feel powerless, the more they believe that economic inequality is fair and legitimate. That has given us the trickle-down theory of economic expansion, for example. We must at all costs protect the rich first. Liu keeps denying this is a self-help, motivational book, probably because it really reads like one. It’s all upbeat you-can-do-it. It is a manual for how to analyze your situation and take action successfully with well-established points. Just in the nick of time.